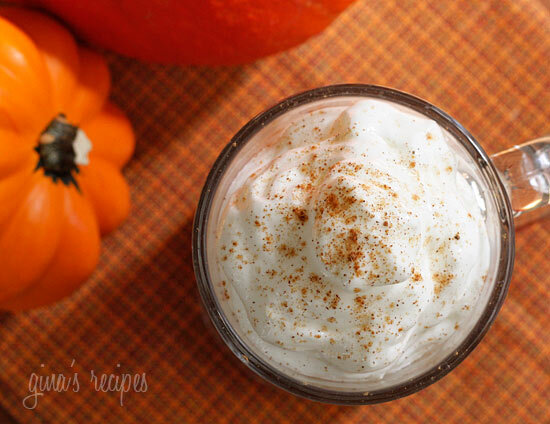 For the pumpkin obsessed, a low fat, low calorie skinny pumpkin spice latte you can make yourself. October is my birthday month and one of my favorite treats this time of year is Starbucks’ Pumpkin Spiced Latte. What a great way to start your morning! More pumpkin obsessed breakfast drinks you may enjoy are my Healthy Pumpkin Oatmeal Shake, Pumpkin Smoothie paired perfectly with a slice of Pumpkin Banana Bread Toast. I also have a delicious Eggnog Latte for those who can’t wait until the holidays! In a small pan combine milk, pumpkin butter and sugar and cook on medium heat, stirring, until boiling. Remove from heat, stir in vanilla. 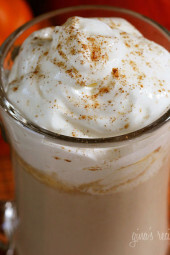 Pour into two mugs, add the hot espresso and top with fat free whipped cream and a dash of pumpkin pie spice on top. I made a strong decaf chai tea instead of espresso, and used almond milk. Delish! I have been addicted to Starbuck's Pumpkin Spice Latte for a number of years now. But $5 for a cup of jo doesn't sit well with me. I've discovered that if I brew my coffee with a couple shakes of pumpkin pie spice, my coffee tastes exactly the same. And for a fraction of the price and well, calories and fat! Amazing recipe, drinking some now. So yummmmmmmmm! And I love knowing since I made it myself, that's its all natural and none of the junk or chemicals Starbucks may use. THIS. IS. AMAZING. Perfect motivation to get me to do my work…sipping this while doing anything makes it SO much better!!! Thanks! When is the 1/2 tsp. of pumpkin pie spice added? Before or after removing from the heat? It isn't mentioned in the directions. Gina, you do not know how happy you have made me! I love pumpkin lattes and this is so much better than the pumpkin sugary syrup concoctions at the coffee house. YOU ROCK! Real pumpkin and real spices in a pumpkin lattte?! Had to try it. Made a vegan version with my expresso machine and '365 Unsweetened Almond Milk' (foams beautifully with a steamer). and I'm Canadian, so I had to add maple syrup instead of sugar, eh? Pumpkin Maple Latte… how great is that right?! Better than Starbucks regular or soy version which is just a bunch of pre-mixed chemicals in a box mixed with coffee. Debating using the milk portion to do a Pumpkin French Toast…thoughts? So so so so good!!!! I have been depriving myself of the Starbucks version due to my diet but this comes pretty close. Thank you! I have a question about the serving size. It says pour into two mugs, but it says it makes 1 latte. So does this mean the calories are really 200+ since its 2 servings? Hi! You have such amazing, yummy recipes that I can't wait to try! I have already begun my own food blogging experience. The link you have provided for the original recipe is no longer valid. You may want to update that. I found it here: http://www.thekitchn.com/diy-pumpkin-spice-latte-96277. I don't do coffee at all, but I'm wondering if I could adapt this to maybe a chai tea or other tea? What do you think? THANKS! I just made the latte this morning. I didnt have whipped cream and it still tasted really good!! I love your site and use recipes here all the time! Making this drink for my husband this weekend!! Thank you gina! I also had the same question as Erin above re: the pumpkin spice. Seeing where it was placed in the ingredients list, I added it when it came time to whisk in the vanilla. I hope that's right. Anywhoo, I used super strong (decaf) coffee and omitted the whip cream (didn't have any! ), and it was fantastic! It was super smooth and tasted oh-so-creamy. I can NOT t believe it has only a hair over 100 calories. Thanks Gina! 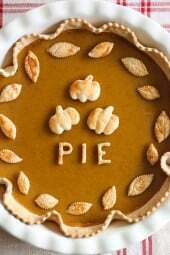 I actually have a question about this recipe . . .I noticed in the list of ingredients you have 1/2 tsp pumpkin pie spice and then you list it again at the end for a topping. Does the 1/2 tsp get added to the milk mixture, or is that the amt we should use for the topping? I just made my pumpkin butter and I can not wait to try this recipe tomorrow morning! All this chatter made me make an "apple butter earl grey vanilla tea" with my homemade apple butter & some skim milk – 1 old pt for a giant mug…. ahhh fall is wonderful! LOVE LOVE Pumpkin everything. 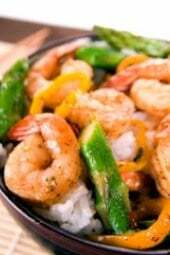 And I cant wait to try this recipe!! Found your sight a few days ago and have tried a few recipes already! Delicious! I made the Pumpkin Butter this morning and had no apple juice on hand. I sub'd applesauce, 1/3 cup of water and one more tsp. of Splenda. It is great! I then couldn't wait to make the Pumpkin Spice Latte and am enjoying a cup right now! I used Almond milk instead of fat free milk…also a good sub! Thanks for contributing to our family's lifestyle of healthy eating while enjoying delicious foods! I loved it, and I don't even like coffee! It's like a warm cup of pumpkin joy, don't you think! Hi Gina…this is awesome. I am drinking your pumpkin spice latte as I write this. Delicious!! I made the pumpkin butter this morning and couldn't wait to try it. 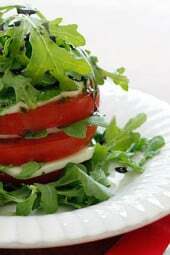 I found your site a few days ago and have already tried a few recipes. I am so impressed. Thanks for sharing. Gina – what an awesome website that you have created & thank you so much for sharing it with us. All of your recipes are great & can't wait to try each and every one of them. I'm a pumpkin & Chipotle lover too so really appreciate you sharing such wonderful recipes that I would not have been able to come up with on my own. Your website will definitely help me on my weight loss (& keeping it off) journey. Thank you! This is soooooo much better than Starbucks!!!!!! I'm born in October and love pumpkin as well! (seems to be a pattern here!) Cannot wait to try this out, since I can't live without coffee or pumpkin! Thanks! You're welcome!! Glad you like!! Omg! I have been making the latte mix in triple batches and keeping it in the fridge when ready to use. Gina this is what I call the Bomb pumpkin latte! My best friend hates pumpkin and she loves this! Thank you so much for all the fab recipes! I just bought maple pumpkin butter from Stonewall Kitchen. I think it would be great in this recipe. Thanks!!! Joanna, It will still be good if it's not whipped. Wow, Uganda, Okinawa, gotta love the internet!! I live in Uganda where there is no Starbucks to be found! But thankfully there are pumpkins to be found, and this satisfied my craving perfectly. Thanks! Sounds delicious! if i only have 1% milk will that change the points much? Made my pumpkin butter about an hour ago, now on to a Vanilla Tea Pumpkin Spice Latte…it is like Thanksgiving in a cup! Thank you! Made the pumpkin butter last night and had a latte this morning and a yogurt/pumpkin butter/granola mid morning snack. Wow!!! Delish…better than Starbucks for sure! just had a cup for breakfast with toast and pumpin butter. amazing, this one is a keeper Gina. i cant wait to put it in my oatmeal. shakes, and pancakes! hooray for pumpkin butter! I am pumpkin obsessed! I love the idea of making this latte at home, since I don't really like the syrups they use at the coffee houses! This is seriously better than the real thing at Starbucks! Delish, rich, creamy and doesn't break the calorie bank. Thanks! I made my minimal one again this morning. I whisked 2TB of the pumpkin butter into my freshly brewed coffee, added vanilla soy milk that I frothed up in my handy dandy Bodum milk frother, and it sprinkled some pumpkin pie spice over the top. Yummy and easy to do. Thanks again for the recipe. I think I have to try the cocoa idea soon too! I made this to start my day and yowza, I was blown away by how good it is. I never ever have good coffee come out of my kitchen, until now. First time for everything! Thanks for the simple and delicious recipe. Can't believe it's light! I'm not a coffee drinker, but was able to adapt this recipe for hot cocoa. Yum! Thanks for posting! THANK YOU THANK YOU! My wallet and I THANK YOU! I am in love with your blog, and all of these pumpkin recipes! 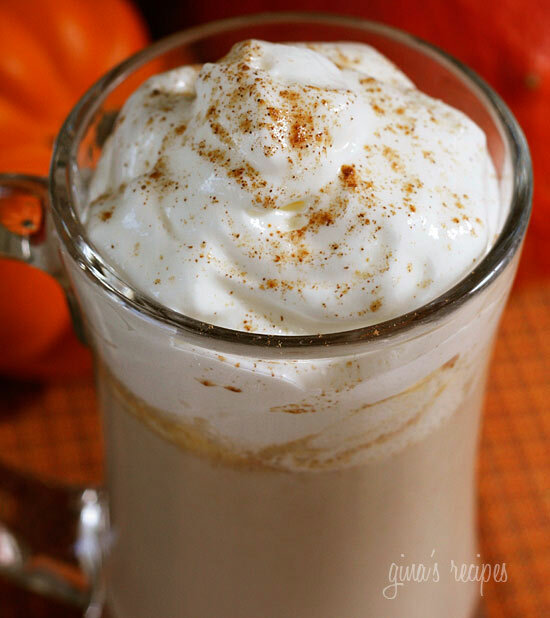 I almost died when I saw this recipe.. pumpkin spice lattes are my absolute FAVORITE! thank you so much for all of these awesome ideas.. can't wait to try this one! kris with a k – join the club! margo – happy birthday month! southern gal – i'm happy you are enjoying them! elizabeth – I love chai! I buy it in Trader Joes, I bet this would be delicious in place of coffee! Coffee drinkers are so fortunate to have all those wonderful flavors. Wonder if the recipe could be adapted for tea drinkers? Hi Gina. I haven't commented in a while, but I just had to stop by and tell you how much I'm loving the pumpkin recipes you're posting. I made a pumpkin flavored coffee yesterday morning and then saw this. I'm going to try it now! Thanks. Oct is my birthday month too! And I love love love pumpkin lattes! Thank you!!! I hope this is not a double post, my other one disappeared, but thank you SO much for this recipe! I LOVE all things pumpkin! This looks great! I love pumpkin spiced lattes! Happy Birthday this month! I'm always sad that Starbucks doesn't offer this flavor in a "skinny" option… this is the perfect solution!! i was just thinking, for a single serving if you just halved everything and used the microwave and a magic bullet that would be quick and easy too. i seriously cant wait to try this. surprisingly filling for an afternoon snack. Thanks Gina for another keeper! You're awesome! Do you think one would be able to make the milk mixture the night before, then just microwave it and add hot coffee to it in the morning?? I usually am in such a rush in the morning, trying to get my son ready, I wouldn't have time to make it this way…but totally want to try it because it looks amazing (like all of your other stuff!!). One of my favorite aspects of October are pumpkin spiced lattes! Hope you're not sick of pumpkin yet… The amount of pumpkin used in this is minimal, you don't feel a texture. vlo- I wanted to give people ideas, but an easy thing to do with it is to add it to your oatmeal, so good!! Starbucks has pumpkin spice lattes, but their nonfat, tall latte is 3 points. This is a PERFECT substitution! this looks good gina, youve sold me on the pumpkin butter. when you posted the recipe for it i thought it looked good but wasnt sure how you would use it all before it spoiled. now i see there are many uses, ill will be making a batch soon. Pretty tasty. Just be aware that theres a certain texture that comes along w/ using actual pumpkin. Thank you for bringing fall and the coffee shop to my home. You make it sound so easy. Where does one get pumpkin butter? I keep seeing it in recipes everywhere.